ChefVille Guide: Prize Level 2 Close To Being Unlocked! 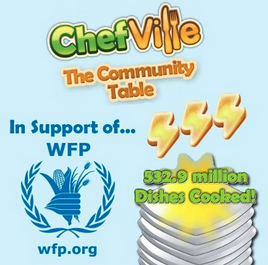 In the past three days, the number of total dishes cooked in Chefville has increased by 67.9 million! If you have not done so, go collect your free energy from Prize #1 in the Community Table. According to Zynga, ChefVille players are very close to unlocking Prize #2 on the Community Table. What do you think the Second Prize will be? Feel free to comment below with your guesses. Also be sure to comment below with any information you have on the Community Table!